Welcome home, pioneer class! 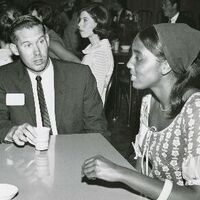 Pioneer faculty, staff, and alumni, please join us for the pioneer class reunion celebration, including a reception, dinner, special program, music, and dancing. The evening begins at 5 p.m. with a reception at the Eloise Pickard Smith Gallery displaying artwork by pioneer faculty Jasper Rose. At 6 p.m., we will move to the Stevenson Event Center for a buffet dinner and special program featuring a conversation with founding faculty and current provosts. Pioneer faculty include: Todd Newberry, Peter Kenez, Murray Baumgarten, Harry Berger, and Bill Domhoff. Just like old times, the Stevenson Event Center will be rocking with the tunes of Flowers of Evil, to close the evening with big fun.